A bathrobe story – how one piece of material can ruin everything. How does someone lose the belt to his or her bathrobe, and why can’t we buy just a robe belt? Over the years, numerous people have mentioned to me they have a bathrobe they really like, but they’ve lost the belt tie which basically makes the concept of wearing the robe a big fat waste of time. How does this happen? Where does the belt go, and why can’t it be found? It’s a big, long, thick, piece of material… it’s like losing seven pairs of socks at once! Regardless, I know these things go missing. So, how can one extend the life of a bathrobe once the belt has run off to join the circus? Improvise. However, it seems to be a relatively untapped market. I have personal experience with this. The best thing to do is when you GET the new bathrobe, sew the exact middle of the belt (just a few stitches), to the exact center back of the robe where it sits when through the loops and tied. It will never leave the robe. That is a great idea! Thank you for the comment. Lost the robe still have the belt……. That’s a more challenging situation! I looked at my tie rack; found an old, dated one, and now have a tie for my robe! This is a great idea! Thank you for commenting. I didn’t lose my belt. It just shredded into a mess. It’s not quite unusable but I’m definitely going to need a new one soon. The rest of the robe is fine and I like it. 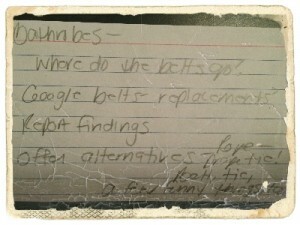 Looks like I’m going to have a hard time finding a belt unless I can find someone to make one for me. 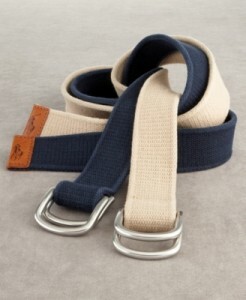 It IS very hard to find a good replacement bathrobe belt. It seems like someone could make them for not a lot of money and sell them – good luck in your search and thank you for reading and commenting! So I left my dog in our air conditioned bedroom while I went off to lunch. The downstairs, not air conditioned, is just too warm for a full-coated Alaskan Malamute, even here in Vermont. (Climate change is a big Chinese hoax, dontchaknow, which must be why we’re having our hottest summer yet.) So I put her in the BR. I came home to pathetic whining and door-scratching. Opening the door, I found an overjoyed-to-see-me Malamute who bolted down the stairs and on the bedroom floor was my robe belt in several wet pieces. Finding a replacement is stupidly difficult so I will use an alternate method. I love dogs! Even if they eat your clothes, dogs are still pretty awesome. Thank you for reading and commenting. I hope you find the belt you’re looking for. 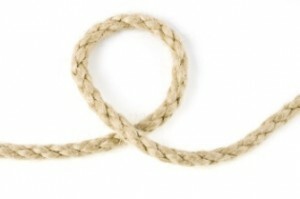 Look up 3 strand 1-1/2″ dia cotton rope. Order 2 yds. Wrap ends with heavy thread to prevent fraying. Hi! This is great advice! Thank you!